A social hub is the perfect counterpart to any social media strategy. Whether you're running a Hashtag Campaign, Photo Contest, or just enhancing a brand message, a social hub should be a crucial piece of your strategy. A hub is essentially all your content collected into a single display. This can be embedded on your main website, a micro-site, or on a big screen at a live event. But why go through the hassle, the content already is viewable on the social network feeds, or maybe you've provided a link to your wall. You might have even embedded the network feed widgets on your site. Isn't that enough!? A hub continually collects all your content, instantly making your website feel alive and dynamic. It takes effort and time to post onto the various social networks, even more so if you're customizing the content to capitalize on each network's strength. Catchy 140-characters on Twitter, great photos on Instagram, or funny videos on Vine. Don't let all that effort just fade away. If you've built up your brand and your fans and audience are constantly tweeting and posting about you, then you definitely want to capitalize on that buzz. What better way, than to feature your user's content. Not only does their content help bolster your brand image, but it also fosters a closer relationship with your audience when they see you highlighting them. If you're running a hashtag or photo campaigns, it's even more imperative that you show all the activity to create a self-reinforcing feedback loop. Following on the previous item, whether you're selling a product, promoting an event, or just boosting your brand. The powerful effect of social proof can't be ignored. We're all driven towards where the crowd because it's one of our learned social signals that something good is waiting. A Social Hub provides continual social proof. Branded Messaging and Engagement Once you have all of your content collected in a single display, go a step further and create more messaging or engagement around that content. Make your hub a destination for your fans to discover and interact with other like-minded people. Create polls, surveys, show trending topics, or feature content from trusted influencers. Embed promotions, sales, coupons. The abilty to embed other elements directly in your social content means you can finally transform the ambiguous likes and fan gating mechanisms to true lead generation and sales. Controlled Content A social hub provides you the ability to craft your social message and image. All to often, we've seen brands and campaigns hijacked by the undesirable few, or hashtag crashers that try to capitalize on your popularity by jumping into your stream. A hub provides the ability to moderate the content to keep out the unwanted or the unintended. A hub provides the ability to style the content to match your promotion and brand's image. Looking to add a social hub for your next campaign? 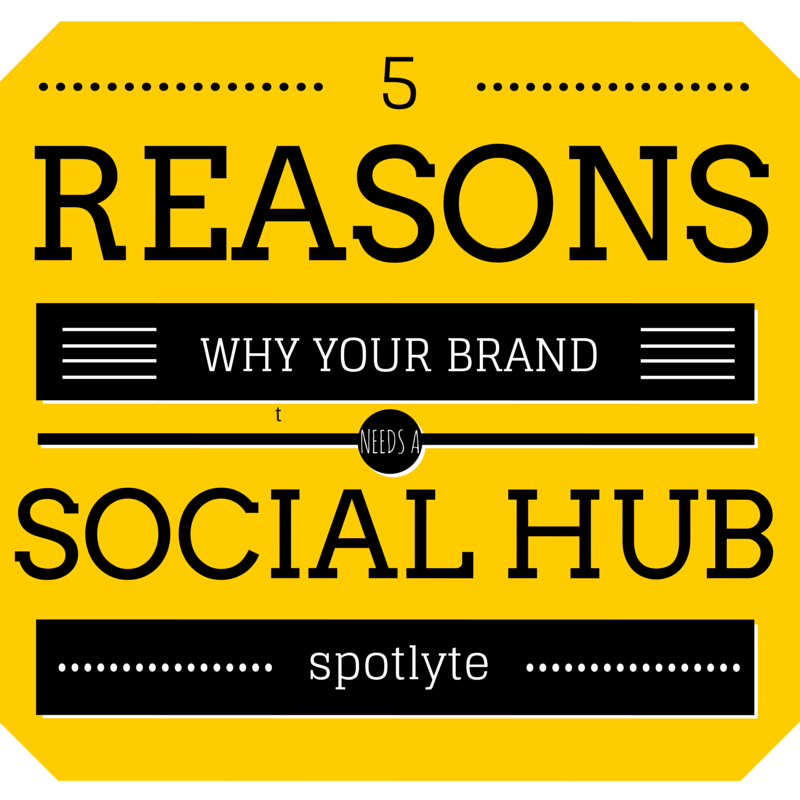 Let the Spotlyte team show you how.